Add this shop to my favorites. Abissinorum Regnu - Hondius (1607). Availability: in stock Condition : Excellent. Date : 1607 Overall size : 18.9 x 20.2 cm Image size : 17.7 x 19.8 cm. 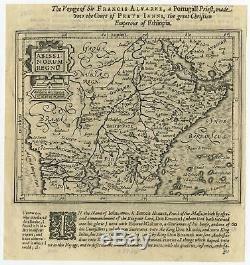 Copper engraved map of the Kingdom of Abyssinia (East Africa) from the first edition of Gerhard Mercator's. Jodicus Hondius published the first "Atlas Minor" in 1607 in response to the idea that there was a market for smaller, handier and cheaper Atlases to make the maps of Mercator available to a wider public; he probably engraved the maps himself. Janssonius, who probably supplied and owned the letterpress. The item "Abissinorum Regnu Hondius (1607)" is in sale since Thursday, August 9, 2018. This item is in the category "Antiques\Maps, Atlases & Globes\Africa Maps". The seller is "bartele-gallery" and is located in Langweer. This item can be shipped worldwide.